There’s enough negative news circulating to make a cockeyed optimist rethink the potential for creating a better way of life—ever! And even Hope is approaching a dangerous tipping point, at least for some, including me. A reading of David Wallace-Wells’ lengthy essay, “The Uninhabitable Earth”, which was recently published by New York Magazine, will likely lead readers to assume—and dread—a future of doom. Even so, It seems worthwhile for people to understand the full implications of the potential horrible realities that might lie ahead; that is, if humanity in unable or unwilling to collectively unite in seeking, finding, and instituting positive solutions. This persuasive essay (See first listing in the Views section) appears to be firmly based on peer-reviewed scientific projections of converging crises, including climate change and exploding human population. It provides a sobering wake-up call for taking immediate, coordinated action. While critics of this article focus more on the ability of humans to effectively tackle all converging crises, there is little denial of the science behind the dire projections. Much of recent news focuses on climate change issues, notably, warnings about mass extinction of species, the massive ice shelf breakaway in Antarctica, rising sea levels that threaten iconic coastal areas, breaking heat records, drought conditions leading to numerous wildfires, and toxic living spaces. Undoubtedly, we’ll continue receiving reports of disastrous climate-change occurrences—as well as experiencing them first hand. So, what measures can each of us undertake to help lower C02 emissions? As the infographic above indicates, the most influential four steps involve: 1) Eating a plant-based diet; 2) Avoiding air travel; 3) Living car-free; and 4) having smaller families (See first article in Solutions). How are you handling these four areas? Bettye and I are about average. We eat very little meat, travel by air infrequently, drive one car (albeit around 10k miles annually), and haven’t had a child since 1964. In fact, we have only three grandchildren, and our youngest of three sons works part time as a research fellow for World Population Balance. Finally, for anyone interested in making preparations and taking action to create personal and community resilience and sustainable lifestyles, there are organizations that provide plenty of helpful information, including transition organizations. As it happens, people living in the Twin Cities have a unique opportunity for learning about transitioning: the Transition National Gathering, which will be held at Macalester College July 27-31. In sum, transitioning for a better life will require each of us to take personal responsibility for effecting positive change, by committing to positive change through constructive action. And it needs to be NOW, not later! > New York Magazine: When Will Climate Change Make The Earth Too Hot For Humans? (David Wallace-Wells). Famine, economic collapse, a sun that cooks us: What climate change could wreak—sooner than you think. > Common Dreams: We Aren’t Doomed By Climate Change. Right Now We Are Choosing To Be Doomed. (Joe Romm). The New York Magazine essay, The Uninhabitable Earth by David Wallace-Wells, is stirring hot debate. “We have been choosing to destroy ourselves for quite some time now. Climate silence and climate ignorance are literally destroying us”. > Ecosophia: July 2017 Stormwatch: Climate Change (John Michael Greer). This month we’re going to talk about the current pace of anthropogenic climate change. That’s perhaps the most massive story of our time; it’s happening a good deal faster than I expected—though in all fairness, a great many climate scientists have been caught flatfooted by the pace of change as well. > Huffpost: Our Values Will Decide Our Destiny (Jeremy Lent). In working on his book The Patterning Instinct: A Cultural History of Humanity’s Search for Meaning, Lent learned that each unique culture shapes its values, and those values shape history. By the same token, the predominant values of our civilization will shape the future, beginning with an emphasis on quality of life rather than material possessions. > Counterpunch: Our Obsolescent Economy (Steven Gorelick). The modern consumer culture was born—not as a response to innate human greed or customer demand—but to the needs of industrial capital, resulting in a “throwaway society” that produces growing piles of e-waste, overflowing landfills, and the squandering of resources and energy. > Peak Prosperity: Bad Models Result In Terrible Outcomes (Chris Martenson). The longer this massive delusion of the viability of perpetual economic growth goes on, the more entrenched I find myself in a foxhole half-filled with dread. The list of things in which I have lost faith in in the US is large and growing: 1) The rule of law: 2) Financial “markets”; 3) Politicians; 4) Sick care; 5) Foreign policy; 6) Environmental policy; and 7) Main-stream “news”. > Resilience: Transition In The Age Of Denial (Shante Sojourn Zenith). Richard Heinberg, Post Carbon Institute senior fellow, will deliver a keynote address at the Transition National Gathering this July 28th. Tickets are still available for Richard’s talk and for the Gathering, which will take place at Macalaster College in St. Paul, Minnesota from July 27th-30th. > The Guardian: Earth’s Sixth Mass Extinction Event Under Way, Scientists Warn (Les Phelps). The scientists claim that up to 50% of all individual animals have been lost in recent decades, and almost half of these have lost 80% of their range in the last century. Billions of populations of mammals, birds, reptiles and amphibians have been lost all over the planet, leading scientists to say a sixth mass extinction has already progressed further than was thought. > New York Times: An Iceberg The Size Of Delaware Just Broke Off A Major Antarctic Ice Shelf (Jugal K. Patel, Justin Gillis). A chunk of floating ice that weighs more than a trillion metric tons broke away from the Antarctic Peninsula, producing one of the largest icebergs ever recorded and providing a glimpse of how the Antarctic ice sheet might ultimately start to fall apart. [See also: Massive #Exxonknew Iceberg Breaks Free and ‘It’s Climate Change’- Will Steger On Massive Iceberg Break-Off]. > E & E Publishing: Iconic Coast Threatened As Rising Seas ‘Drown’ Beaches (Anne C. Mulkern). Unstoppable sea-level rise is a steady peril coming to California’s iconic coastline, threatening to transform beaches, boardwalks, and oceanfront cities. > Common Dreams: ‘When Rising Seas Hit Home’: Hundreds Of Towns Threatened By 2100 (Jessica Corbett). Daunting new report by Union of Concerned Scientists) shows coastal communities are at-risk and unprepared for flooding caused by climate change. > Post Carbon Institute: Controversy Explodes Over Renewable Energy (Richard Heinberg). Both sides of a heated scientific debate over whether a combination of wind, solar, and hydroelectricity could fully power the U.S. completely overlook half of the equation: a need to focus at least as much on the demand side of the energy equation as on the supply side—in combination with a deliberate and humanely guided policy of population decline. > Think Progress: The Hidden Toxic Threat In America’s Backyards (Yvette Cabrera). Childhood lead poisoning dramatically decreased across America as the federal government began phasing out leaded gasoline in the 1970s. But many children are still being exposed today because of lead’s legacy: polluted environments, particularly in urban areas. > The Atlantic: Why American Health Care Is So Much Worse Than Europe’s (Olga Khazan). The Commonwealth Fund has released its latest evaluation of what, exactly, ails the U.S. health-care system. Once again, the think tank found the U.S. medical system performed the worst among 11 similar countries, all while spending more. 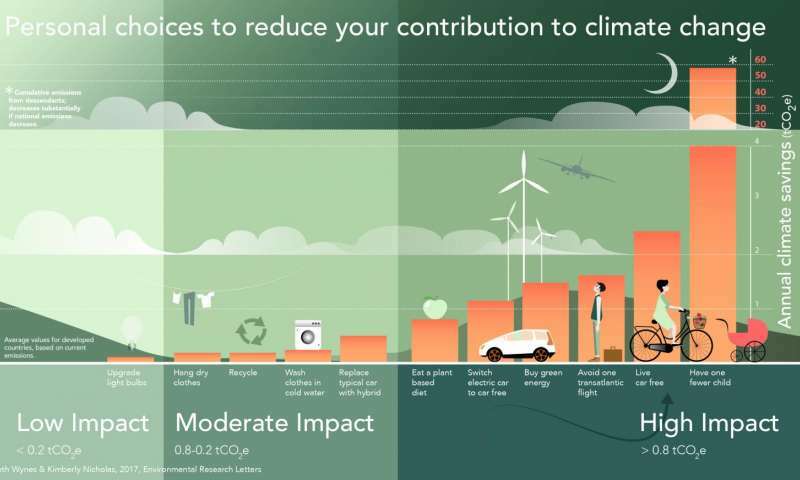 > PHYSORG: The Most Effective Individual Steps To Tackle Climate Change Aren’t Being Discussed (Staff, infographic). The four actions that most substantially decrease an individual’s carbon footprint are: eating a plant-based diet, avoiding air travel, living car-free, and having smaller families. > Yes! Magazine: Our Best Shot At Meeting Paris Goals? Make Energy Public (Sarah van Gelder). Mayors across the country have vowed to deliver on the goals of the Paris climate accord in defiance of President Trump’s decision to back out. But how can they, realistically, when the national government is questioning climate science and promoting coal, fracking, and pipelines? Simply put: Make energy public. > Earth and Space Science News: Communities And Experts Collaborate For Climate Resilience (Nancy D. Lamontagne). The Resilience Dialogues program provides resources and expertise to help communities build individualized plans for resilience in the face of climate change. > Ensia: We Can No Longer Outrun Antibiotic Resistance. Here’s What We Need To Do (Lindsey Konkel). Disease-causing bacteria are becoming resistant to antibiotics more quickly than we’re discovering new ones. Armed with greater knowledge of the antibiotic resistome, scientists can devise ways to counteract resistance to the drugs we already have and the antibiotics of the future.